Daniil Granin pioneered a new genre of documentary fiction in the Soviet Union. 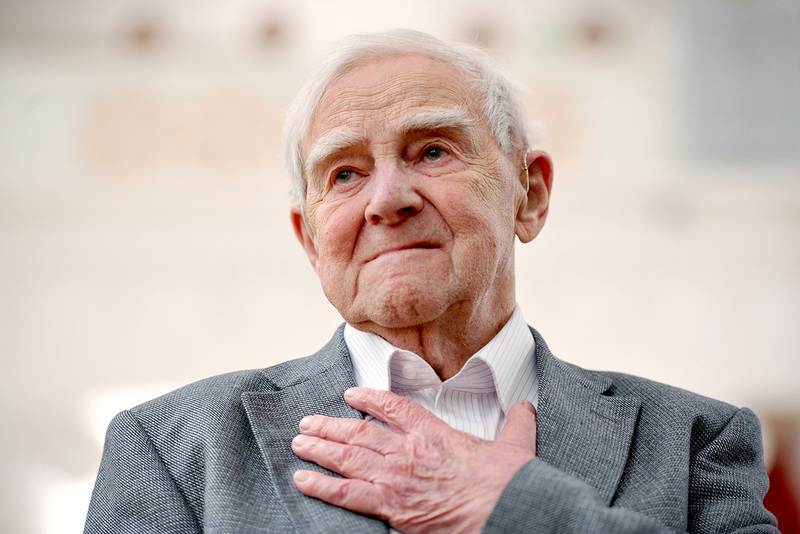 Prose writer and public activist Daniil Granin died on July 4 in St. Petersburg at the age of 98. While writing about the life of scientists and technological progress, he pioneered a new genre of docufiction in the Soviet Union. However, the writer’s main theme was the Great Patriotic War. World War II is perhaps the most tragic chapter of the 20th century. Written by Daniil Granin together with Belarusian author Ales Adamovich, Leningrad Under Siege(known in Russia as The Blockade Book) offers vivid and detailed accounts of the 900 terrible days of the blockade. The authors collected the stories of about 200 survivors to produce a book that is both stunning and terrifying in its truth-telling. The work chronicles the life and death struggle of a city and its people, who, condemned to hell on earth, never surrendered. In 2009, Russian director Alexander Sokurov shot a documentary based on the novel. In 2013, the book was included in the top 100 recommended novels for schoolchildren to read at home. Those Who Seek is the first novel by Granin and his most famous work. This Thaw-era novel tells of the personal and professional trials and tribulations of an electrical engineer who shocks his academic colleagues by accepting a pay cut to take charge of a practical laboratory so that he can fulfill his dream of developing a leak-locator (a device for locating breaks in electric power cables). The novel inspired a movie by the same name in 1956. Following the success of Those Who Seek, Granin gave up his scientific career and devoted himself solely to writing. "I wrote about engineers, scientists, researchers, about scientific creativity, it was my theme, my friends, my environment", Granin wrote in his autobiography. "I loved those people — my characters, although their life was uneventful. It was not easy to portray its inner tension." The documentary novel The Bison is based on the true story of Soviet geneticist Nikolay Timofeev-Ressovsky who worked in Germany for 20 years during the Stalin era and faced consequences upon returning home. Granin knew Timofeev-Ressovsky personally, used to talk with him, admired his powerful intellect, talent, erudition, and extraordinary memory. The novel is about young physics who dream of controlling thunderstorms. The book shows an insight into the turbulent lives of Soviet scientists themselves, their motivation, their rivalries, their loves - and hates. Daniil Granin also wrote a screenplay for a two-episode drama with the same name from 1965 by Sergei Mikaelyan. This documentary story about biologist and philosopher Alexander Lyubischev was first published in the Soviet Union in 1974 with 100,000 copies, a huge number at the time, being printed. This book depicts a pioneering and complex scientific system, created by Lyubischev. This book is well regarded for inspiring the idea of modern time-management (the idea Lyubischev’s system focused on). It was translated into English and German.